I was the worst dater of all time. I tried alternative approaches. I tried going on dates with people I wasn’t really immediately attracted to, knowing I would be able to keep my wits about me and at least have a conversation and some free food and drink. Turns out the type of guys that were interested in me were also of the “case closed, I dig you, I have no game whatsoever” persuasion. But substitute the deer in headlights bits with relentless pursuit in the face of polite, or even sometimes, rude rejection. 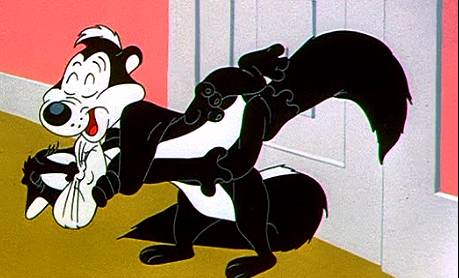 My sister used to say I was the kitty in that Pepe Le Pew cartoon, the one who inadvertently walks under the painted flagpole and is pursued by a relentless skunk. In fact, she gave me a matching set of stuffed animal representations of the pair. I think I still have them, actually. Come with me, to the Casbah…. When I met my now-husband, he wasn’t on my dating radar. And I wasn’t on his. This was good for both of us, as his game is about as good as mine. And I am happy to say, we grew together like a couple of trees whose roots twisted their way around each other until you can’t distinguish the individual sources. I love him and he loves me, and we have a happy family. Phew. So glad that business is over with. But as I navigate this freelance writing world, I can’t help but have dating flashbacks. I’m trying REALLY hard to play it cool. Be aloof. Suave. Witty. Charming. Sassy, even. I’m no longer the terrified little cat, after all. I can do this. Also, I’m a grown up now. And grown ups are supposed to remain sophisticated and calm, knowing that the upper hand is held by the person with confidence. Fake it until you make it and all that jazz. Thankfully, no editor can see me hit refresh on my inbox every five minutes, or hear the tippy-tapping sound as I nervously fidget on the keys just lightly enough that no letters appear. And I’ve just confirmed that no webcam exists on my desktop, so it’s not even possible that I accidentally sent video evidence, like the time I accidentally didn’t hang up the phone with my new crush and blathered on to my roommate about how dreamy he was for approximately five minutes straight without stopping for air. So I’ll keep putting myself out there. I’l throw on my fiercest shoes, chat up some cute boys, and see where the night takes me.